Drawer pulls from The Door Knocker Company are sometimes refered to as cup handles. They are a covered pull to be used on drawers, cupboards, desks and cabinet furniture. The cup handles are traditionally made in cast brass and cast iron using authentic patterns to create faithful replicas of the originals. The brass is hand polished and left unlacquered to take on a patina over time and the cast iron is lacquered, protecting the iron from the damp of a kitchen, for example. 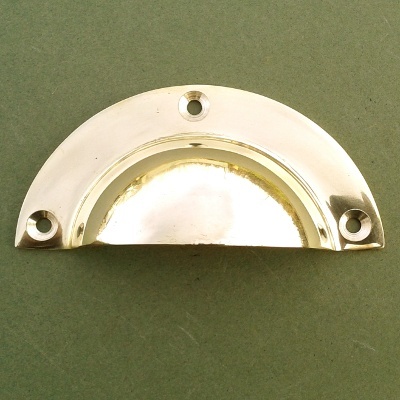 The popular polished brass drawer pull or cup handle with a rectangular back. Traditionally cast and hand polished. Size: 100mm (4") wide x 40mm (1 1/2") high. The popular polished chrome drawer pull or cup handle with a rectangular back. Traditionally cast and hand polished. Size: 100mm (4") wide x 40mm (1 1/2") high. A decorative cast iron drawer pull, or cup handle in a Victorian style. Cast from an original and finished with a protecive lacquer. Perfect for kitchen and bathroom drawers as well as desk and cabinet furniture. Sizes 110mm (4.25") wide x 40mm (1.5") high. A decorative cast brass drawer pull, or cup handle in a Victorian style. Cast from an original, hand polished and left unlacquered for an authentic finish. Perfect for kitchen and bathroom drawers as well as desk and cabinet furniture. Sizes 110mm (4.25") wide x 35mm (1 3/8") high. A traditional plain cast iron drawer pull or cup handle. Cast from an original with a protective lacquer finish. Perfect for kitchen and bathroom drawers as well as desk and cabinet furniture. Sizes 100mm (4") wide x 40mm (1.5") high. A traditional plain cast iron drawer pull or cup handle. Cast from an original and ready to paint or lacquer to match your kitchen, bathroom or cabinet furniture. Perfect for kitchen and bathroom drawers as well as desk and cabinet furniture. Sizes 100mm (4") wide x 48mm (1.5") high. 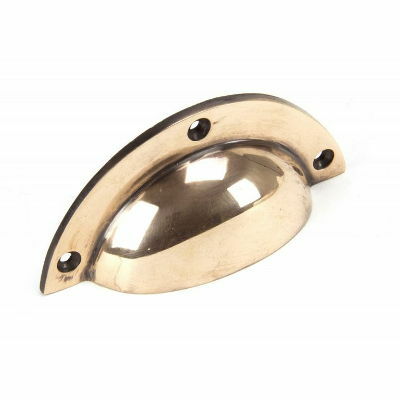 A plain solid brass Victorian drawer pull or cup handle with a hand polished finish. Size: 120mm (4 3/4") wide x 45mm (1 3/4") high. 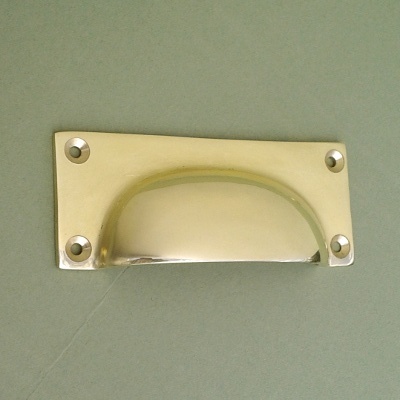 A quality plain solid brass Victorian drawer pull with a hand polished finish. Size: 100mm (4") wide x 44mm (1 3/4") high. This is a traditional polished brass drawer pull with 3 screw holes. Ideal for kitchen units or to refurbish an old desk. Size: 100mm (4") wide x 23mm (1") high. This is a traditional polished chrome drawer pull with 3 screw holes. Ideal for kitchen units or to refurbish an old desk. Size: 100mm (4") wide x 23mm (1") high. The reeded design of this cast brass drawer pull is of a typical Regency design but suitable for traditional or modern kitchens or furniture. Size: 105mm (4 1/8") wide x 35mm (1 3/8") high. The lovely dome shaped cast brass drawer pulls have an arts and crafts pattern making them a popular choice for home renovation. Size: 110mm (4 1/4") wide x 40mm (1 1/2") high. The pretty shell drawer pull is made from cast brass with a hand polished finish. Size: 98mm (4") wide x 50mm (2") high. These dramatic solid brass drawer pulls depict neptune on the front, surrounded by waves. Hand polished finish. Size: 110mm (4 1/4") wide x 40mm (1 1/2") high. 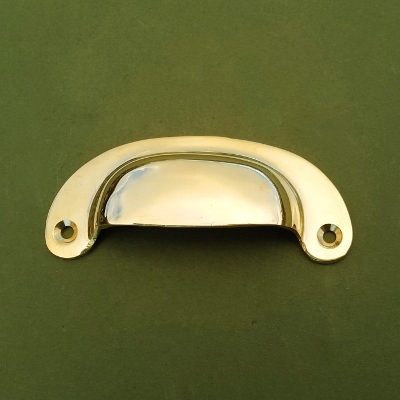 A plain polished brass drawer pull which is perfect for a new kitchen or a kitchen makeover. Size: 87mm (3 3/8") wide x 39mm (1 1/2") high. A pair of solid brass Art Nouveau pull handles made in England. A cast iron gothic style kitchen cupboard and drawer handle. A small cupboard or drawer handle hand made in wrought iron. The larger of our two black wrought iron cupboard or drawer handles. A small black wrought iron cupboard or drawer handle with with rounded ends. Beautiful hand forged wrought iron cupboard door handles with bean shaped ends. Forge blackened and finished with a protective bees wax. Sizes: 152mm (6") high x 48mm (1 7/8") max width. A 4" wrought iron cupboard handle with a black bees wax protective finish. A long slim wrought iron cupboard or drawer handle ideal for a new kitchen or kitchen renovation. Sizes: 132mm(5 1/4") long x 20mm (3/4") wide. An elegant bass cupboard or drawer handle, cast and hand polished in the UK. Size: 147mm (5 3/4") high x 30mm (1 1/8") wide at the ends. Wrought iron bean cupboard and door handles with a durable pewter patina available in 3 sizes. Sizes: 206mm (8"), 155mm (6"), 104mm (4").